We are in the midst of the digital revolution. Everything we do in our lives is now completely globalised and digitalised. We have come to accept that we now send an SMS instead of making a call, and we pay our bills online instead of at the local post office. Over the past 10 years, there has also been a massive shift from traditional currency to digital currency. Bitcoin enthusiasts have been urged to start making purchases with their crypto to ensure the future successes of the digital currency revolution. While there is a lot of information and hype out there regarding cryptocurrencies, one thing that people are still not aware of is how it can be used in everyday life. Common questions we hear people ask include: do I continue to invest my digital currency until it becomes the norm? Do I splurge on an item I don’t need because the retailer accepts cryptocurrency? We have seen larger companies adopting cryptocurrencies as a payment method in recent years – ETSY, OKcupid and Microsoft were all early adopters. As this becomes more common and more people get used to paying for things with their crypto, the industry will explode. Being a store of value that you control. Privacy and lower risk of identity theft. However, most people are purchasing cryptocurrency as a speculative investment, with the aim of making a short-term gain or as part of a diversified portfolio for the medium to long-term. 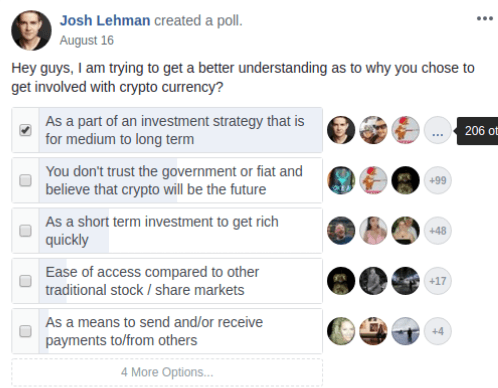 I recently ran a poll on Facebook to get a better understanding of why people decided to get involved with cryptocurrency. As you can see from the results above, more people are motivated by a medium to long-term investment strategy. Similarly, 48 people said they invested in crypto as a short-term strategy, hoping to get rich quick. The second most popular response highlights the long-term benefits that digital currency offers, with 99 people saying they don’t trust the government or fiat and believe that crypto will be the future. Let’s consider some companies who have disrupted an industry. Uber own no cars, Facebook doesn’t own any content and Airbnb doesn’t own any property. If you think back to when these companies all started, it seemed like a crazy idea – until it wasn’t. While the digital currency revolution is making massive strides in the global market, it will not likely take over the traditional dollar anytime soon. So, with a limited number of retailers accepting cryptocurrency, how can people who are heavily invested in crypto ensure that the industry continues to grow? Despite the boom of the digital currency industry in recent years, there are still a lot of people who are unaware of what it is or how it works. This will change over time, but there are things that the crypto community can do today to help strengthen and grow the industry. For cryptocurrency to become a widely accepted form of payment in businesses and restaurants around the world, the current community needs to lead the way. You may have heard of the great work the travelbybit.com team are doing. TravelbyBit is a blockchain payment platform and travel company that offers booking services for travellers using digital currency. Their headquarters are located in Brisbane and their POS system is set up all over Australia. It’s an exciting development as TravelbyBit are introducing the world to digital currency tourism. Unfortunately, it doesn’t seem like many people are using it yet, including us enthusiasts. At the last Crypto Australia meetup in July, someone asked the question: “Who has recently purchased something with crypto?”. Surprisingly, only a few hands went up. You’ll need to set up a few things before you can pay for a beer, including a mobile wallet. Going out for lunch with a few friends? Attending a business meeting in the city? Consider going to a venue that accepts crypto and show your friends and clients how easy it is. What do you normally do with your crypto that you acquire from mining or any other means? Do you simply convert it back to Australian Dollars? If you have some crypto, instead of simply converting it back, you can help facilitate the ecosystem by paying your bills directly with crypto. I have met some privacy-centric people that get paid only in crypto. They try to live completely through crypto, using it to do everything from everyday purchases to paying bills. Until everyone accepts crypto directly as a payment means, it’s not possible to pay for all items without the use of a credit card. However, you can use crypto to pay off your credit card. If you want to learn more about how you can pay your bills with Bitcoin check out this article I have written about how you can do it faster, cheaper & easier on the Digital Surge platform. I’m the co-founder of Digital Surge - Australian Bitcoin Exchange. We provide a fast and easy way for Australians to access cryptocurrency. I’ve spent over 10 years working in the IT industry and know first hand that technology doesn't need to be complicated. It is our mission to simplify access to cryptocurrency and to educate and support our customers throughout their journey.